I am working on two things right now: overhauling the item system in order to achieve less memory consumption and working on the dual interface system. The way my interface works should obvious by now. Operations are grouped by category. You select the category and the the operation. Selecting a category gives you all the possible operations, with the inactive ones disabled. This way I can facilitate the process of memorization by having constant position for the different possible actions. You can use the mouse to select operations, but the final objective is to memorize shortcuts. I will always remember that 1,1 is wall digging for example. You may have noticed the secondary interface taking shape: a new panel, that has sections for floor, cell content and will even show dwarf information or stockpile information depending on the content of the cell. Every section will display some buttons for operations. Last time you saw a screenshot with this I was totally not seeing the forest because of the trees and I actually added all buttons instead of only the relevant ones like in the old interface. This will change, and you will get context sensitive buttons with only the possible operations. 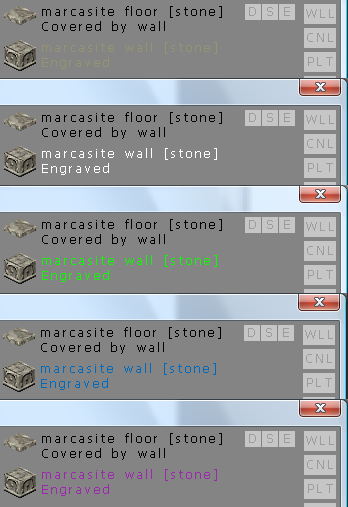 I am also reworking the item system, but I need to tackle every category of items separately. I am almost done with the wall system. The problem is that the new system is easy to create but difficult to change. So I am taking my sweet time designing all things on paper first and also making sure I include some space for properties I may need in the future. 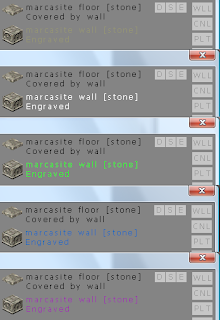 As a side effect, in the next post you should see sand floors and walls, not just soil and stone. These colors are not random and should be familiar to a large percentage of the gaming crowd, ever since back in the day Diablo made the both popular and instantly recognizable. We all want purplez, don't we? The poor contrast the colors have with the background is only temporary. Actually, the whole new panel is still very rough around the ages. I know that the last few post were not particularly exciting with huge features announced, but the small maintenance and detail work must also be done by someone. Keep the posts coming. Looking forward to this game.